We're approaching that time of year when we're so over the current season and very much ready to move onto the next. In summer, this usually occurs at the end of September (if we've been lucky enough to have an Indian summer). In winter, however, it's around the end of January or beginning of February (we Brits will find any excuse to complain about the weather). Dealing with weather extremes is tiring, especially for our wardrobes. Eventually we run out of creative ways to wear five or more layers, so we end up cocooning ourselves in the thickest, comfiest knit we can find 24 hours a day, seven days a week. But all is not lost. We've found a way to help your wardrobe last that little bit longer, and that's through accessories. Yes, it might sound simple, but if there's one common theme amongst our favourite fashion editors or influencers, it's that they know how to use accessories to their advantage. Whether it's a cheeky hair clip or a statement belt, a well-chosen accessory is sometimes all it takes to give a well-worn item a new lease on life. It's cheaper than splurging on new clothes, and unlike most clothing items, they can be worn with multiple outfits. Spring will be here soon, we promise. Scroll down to see the 15 ways to use an accessory to elevate any winter outfit. 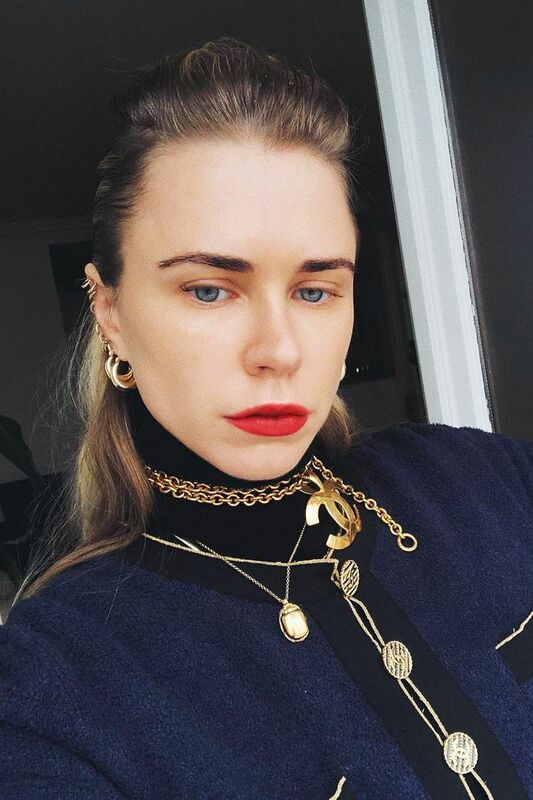 Style Notes: Courtney Trop is a connoisseur when it comes to maxing out on jewellery. A simple cardi and roll-neck become an '80s-inspired maximalist's dream thanks to the addition of chunky layered chains and gold hoops. Style Notes: This season, elevated loungewear has become a mainstay in our wardrobes. A pair of oversized, chunky hoops is sometimes just what jersey fabric needs to feel a little more polished, as seen in Slip Into Style's high-low ensemble. Style Notes: Last year, pearls shook off their fusty reputation and took on a new, cutting-edge persona. Take your cues from Nnenna Echem and style an everyday knit with a string of pearls and simple drop earrings to watch your winter basics come to life. Style Notes: No longer the reserve of tourists, the belt bag is another accessory that has been given plenty of airtime this winter. They come in all shapes and sizes, but we've fallen for this pretty (if not a little impractical) piece worn by Enis, which adds interest to her minimalistic blouse-and-trousers pairing. Style Notes: Out of all the throwback trends of 2018, the Fendi baguette has got to be one of the greatest. When your outfit is unadorned, this iconic bag will add instant kudos. For best results, bag yourself a vintage original. Style Notes: Furry and fabulous, animal-print bags may seem like a fashion purist's worst nightmare, but as Kat Collings shows, they could not look cooler when juxtaposed next to supremely simple separates. Style Notes: Anyone worth their salt has been belting their jackets this season. Be it a structured blazer or roomy camel coat, this styling hack is indispensable when piling on the layers, as it instantly adds definition. Style Notes: Okay, so we loved belt bags so much that we featured them twice. If you're repping the tonal trend, there's nothing chicer than adding a colour-match belt bag, as seen on Oumayma Elboumeshouli. Style Notes: If your winter dresses are starting to look a little sorry, a chain belt is a super quick way to create shape and add trend points (the '90s are here to stay, so don't try and fight it). Style Notes: If you're bored of the standard accessory offering, hair accessories are the thing for you. This February, embrace your inner Blair Waldorf and don a statement headband. Make it velvet and big (or go home). Style Notes: Hair slides might remind you of your childhood years, but thanks to designers like Simone Rocha and Shrimps, they've been given a new lease on life. They'll add an elegant twist to any look. Style Notes: We can't get enough of Alexis Foreman's black bow hair embellishment, especially when it's paired with a messy, low bun. We'll be styling ours with cosy camel cashmere and black trousers for work. Style Notes: Cheap, stylish and easy to throw on, we're big champions of the silk scarf here at Who What Wear. For a throwback vibe, try knotting a skinny silk scarf with your favourite jumpsuit. Style Notes: Tying a scarf around your head is a fun accessory option for more adventurous dressers. Keep it from creeping into grandma territory by pairing with graphic, modern separates. Style Notes: Bring a little Wild West to your winter wardrobe by tying a silk scarf around your neck and allowing the bottom to hang loosely. Pernille shows us how it's done with her tan scarf and white ribbed knit.